Exotic, riveting, well-staged and unbelievable (but painfully true) Robert Allan Ackerman’s “Blood” is ‘proof positive’ that amazing theatrical experiences can be found in smaller venues! “The Garage” Presents “Blood”—A World Premiere Political Thriller With Music, March 5th–April 3rd, 2016, At “The Complex” in Hollywood, CA. There’s a Biblical verse that advises, “The life of every creature is in its blood”, but not too long ago (perhaps much more recently than many of us like to consider) ‘blood’ literally could be a potent conduit of death when it was tainted with the AIDS virus. Even worse, when some of this tainted blood was knowingly sent to Japan in the mid-1980’s at the peak of the global AIDS crisis, it created a scandal that cost the lives of nearly 2,000–most of them hemophiliacs, after U.S. companies sold that country non-heat-treated blood products (by then a standard procedure to ensure safe and healthy blood in order to prevent the spread of infection.) The scandal triggered public outrage against the drug industry and the Japanese government officials charged with regulating it. The ensuing trial was to last over a decade. Now, in conjunction with “The Garage—“L.A.s newest Theater Company, Award-winning Writer-Director Robert Allan Ackerman explores this incident with the World Premiere of his unflinching new play with music, “Blood” which opened Saturday March 5th, 2016, at the “Ruby” theater in the heart of Hollywood California’s landmark “Complex”. Indeed, the theater provides an intimate setting that puts audiences directly in the heart of all the action while making great use of the entire space—and, given the Director’s innovative (at times completely entrancing) staging, fundamentally makes this modest theater seem far larger than it is! 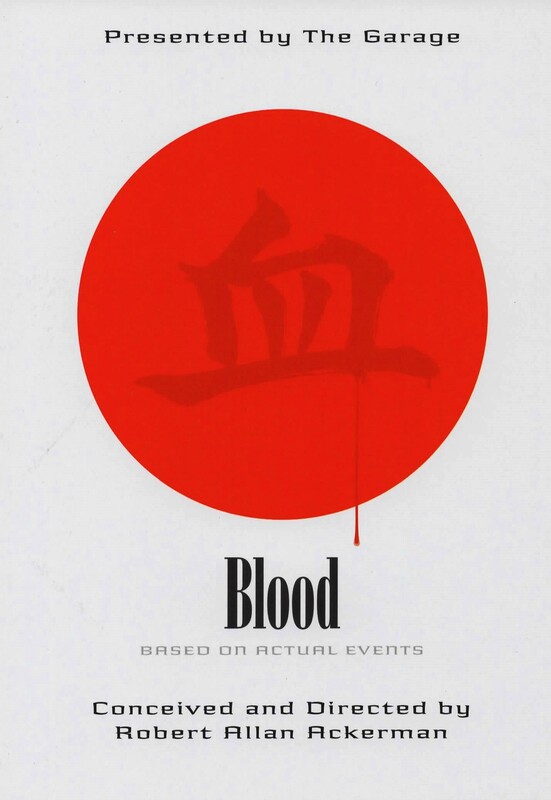 Based on actual events, this sharp and always captivating political thriller opens in Japan 1983. Right off we’re informed that in May of that year a secret meeting took place among Japan’s “medical elite’ regarding a mysterious illness one young man—a recent traveler to the U.S.–was suspected of having; the symptoms were alarmingly comparable to the AIDS virus, however, according to “Dr. Kazama” a leading ‘expert’ in blood borne diseases and the head of Japan’s ‘Hemophiliac Society” this affliction couldn’t in any way be AIDS because the man was full-blooded Japanese, and it was the doctor’s firm assertion that Japanese people by virtue of their race were entirely immune to any such ‘Western Diseases’ (“We are the Master-Race of Asia” he exhorts “We will not suffer the diseases of the West!”) Enter Ms. Jules Davis—a freelance journalist from America who has returned to Japan where she had previously taught, looking for a fresh start after the sudden, tragic death of her only child “Noah”…he was just nine years old. When her old college friend “Ken” dies under mysterious circumstances with all the markings of a cover-up (the ‘official’ cause listed by the hospital is “Brain Hemorrhage”) it sparks Jules interest and need to find out the truth. For starters, it turns out Ken was also a man with a secret (causing even those closest to him to call him “Cryptic Ken”!) He too, was a hemophiliac in a country where any physical weakness or infirmity is considered cause for great shame–so much so that he had resorted to secretly giving himself the required transfusions—on his own! 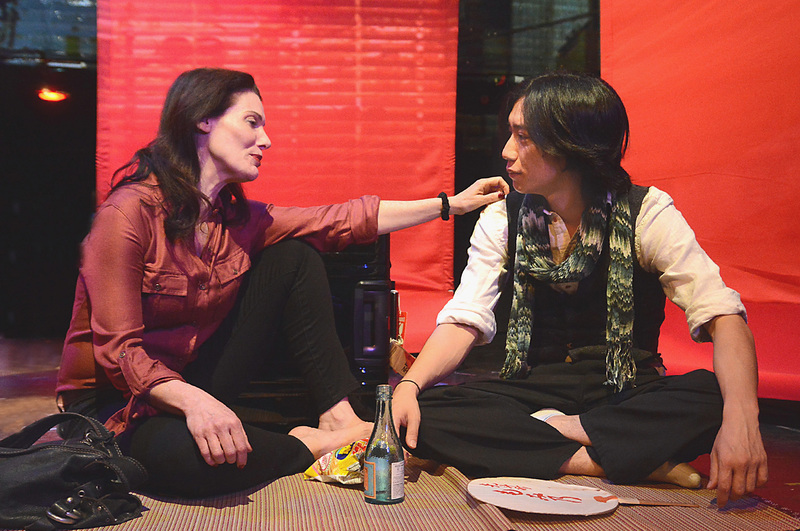 A frustrated feminist in a Paternal culture, Jules must deal with the frequently maddening closed-nature of Japan and its citizens—most emphatically when it comes to something as “Westernized” as a disease like AIDS. Ultimately, her hunt leads her to a secret society known only as “The Chrysanthemum Club” comprised of government officials and captains of industry either directly or indirectly tasked with maintaining the public’s health. Joining her is “Koji Kurosawa”–a Japanese Lawyer of Korean descent who, due to fears of societal ‘disapproval’ of his Korean roots, has opted for a Japanese name over that of his family’s. He assists Jules in her investigation, eventually taking up the cause to bring a class-action suit against the Government (something absolutely unthinkable at the time) in order to gain the victims some modicum of justice. By turns, their investigation begins to reveal Japan’s dirty secret—including all the secret hospital wards, and hiding those afflicted (“That’s crazy” Jules says when she hears of the outlandish treatment her friend Ken experienced in his final days; “That’s Japan!” Kurosawa replies.) Worse still, they discover how U.S. companies, prohibited from selling tainted or untreated blood on its own shores, have instead begun exporting it overseas—with Japan, we’re informed, as its biggest customer! 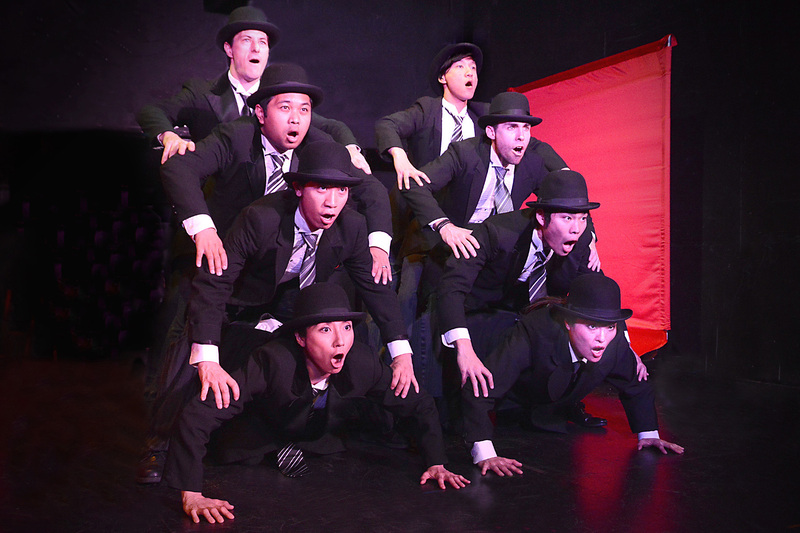 Soon it becomes all too apparent that, (as members of the ensemble loudly intone) “AIDS Has Come To Japan!” and Dr. Kazama is even heard to caution his fellow countrymen “Beware of Foreigners—especially Americans!” So to the collective chant of “Protect Japan” Act One comes to a close. The trouble is, as Davis and Kurosawa soon find, many of the casualties of this unhealthy blood want to remain hidden rather than face the brutal stigma of having the disease! What’s needed is just one Japanese person with HIV brave enough to come forward and allow their voice to be heard. That person is a young boy named “Koyo Ninomiya”—a character based on the real life “Ryuhei Kawada”—now, at 40 years old, a current member of Japan’s “House Of Councilors” and the boy to whom and through whom the events portrayed in “Blood” genuinely occurred! Ackerman has created a compelling script—much of it utilizing the device of having the actors address the audience directly to indicate the passage of time, while in other instances acting out or dramatizing the events, while sandwiching in just the right amount of ‘heightened ’ theatrical moments via song or dance. The collective effect is quite haunting and awesome to behold. Original songs and music are by Nick Ackerman, Bassist for the group “The Virgins”, and Chris Cester—the Drummer and Vocalist for “Jet”; they gain decidedly felicitous musical footing by adapting (and riffing on) the opening strains of “Gilbert and Sullivan’s” classic operetta “The Mikado” to lay the foundation for the ‘theme’ for the various “Ministers Of Japan” (“We are ministers of Japan” they gloat at one point “with fancy cars and big cigars!”) In addition to reinforcing the over-all ‘intensified’ reality Ackerman’s staging so sumptuously conjures, the musical moments shrewdly lighten or balance the heavier ones (or sometimes even enhance their poignancy!) Moreover, Ackerman’s choreography is further evidence of just how multi-faceted his creative faculties are. Although it may be portioned out in brief allotments, it’s always clever and never what you’d expect! 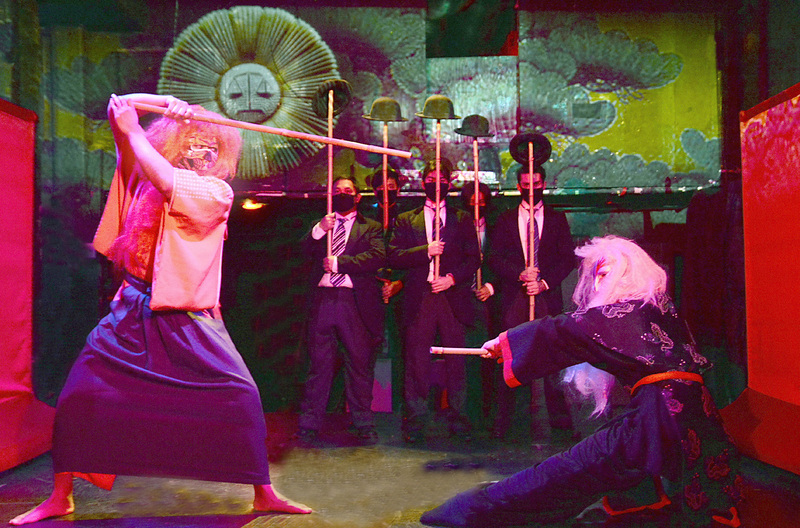 Recalling in several cases, broad elements of classic “Kabuki’ theater to serve as commentary on what’s happening (such as during the court room scenes,) in a like manner he utilizes moves straight out of “Vaudeville” or old, silent movies for the larger chorale endeavors, saving some truly gracefully adagio-styled steps to introduce quieter moments. He even creates a bouncy little interlude presenting the workers of “Green Hope Pharmaceuticals”, the company responsible for distributing the tainted blood, in a staunchly obedient ‘ode’ to their ‘Sainted’ employer! 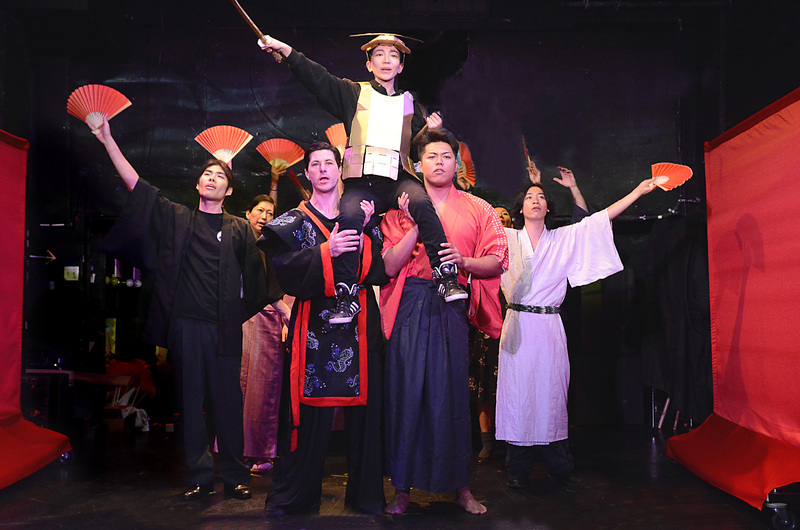 Later, Act Two begins with a rousing (and very symbolic) “Hail To The Child Warrior”—another stirring group effort reminiscent of a number that could be found in a musical like “Hair” as the cast triumphantly bring on the armor-clad lad, “Koyo” hoisted onto their shoulders! Shortly after, the pivotal trial against the government is introduced by a somber funeral march. The impact of these accomplishments are enriched immensely through the inspired use of screens, projections that come courtesy of Hana S. Kim’s artistry and are complimented by Donny Jackson’s equally bold, multicolored lighting design, along with Dona Granata’s striking, predominantly red-hued sets and imaginative costume designs (with help from assistant costume designer Wendell C. Carmichael,) that borrow from both Eastern and Western traditions. The entire 14-member company are hard-working and adept at virtually everything they are called upon to do (–and it’s a lot) yet the production specifically hinges on three or four performances that influence all the others around them. Kazumi Aihara is also commendable as Dr. Kazama’s Nurse, “Eiko Asami” who proves instrumental in bringing the cover-up to light by likewise daring to question her ‘superiors’ for the sake of justice, while “Koyo Ninomiya”—the “Child Warrior” infected at nine years of age, but who insists on making a nation wake up and take notice, is convincingly played with awesome conviction and quiet strength by Ms. Miho Ando, who similarly doesn’t put a foot wrong in a sincerely touching portrayal. Not to be over looked either is Takaaki Hirakawa as “The Singer” who serves as a stylish kind of Asian “David Bowie-esque” M.C. 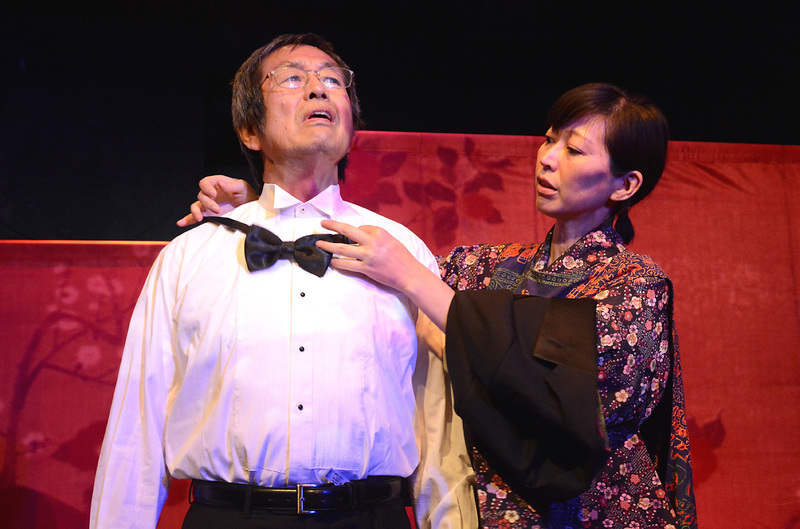 (–even sporting eerie skull-faced kabuki make-up early on) His role is delectably reminiscent of such other ‘larger than life” characters as “Cabaret’s” “Master Of Ceremonies”, “The Engineer” in “Miss Saigon” or “St. 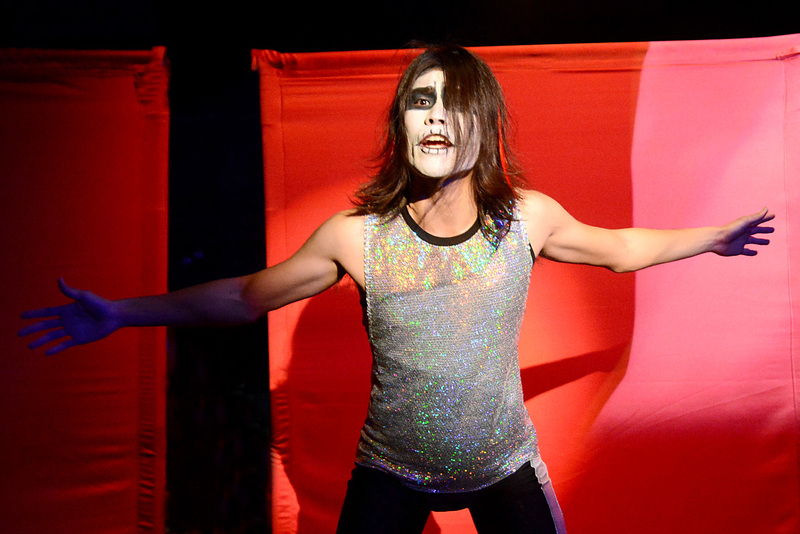 Jimmy” in “American Idiot”; more the ‘spirit’ of the show than a full-on developed personage, this artifice is not just made believable, but made incredible thanks to Hirakawa’s electrifying voice. His opening number, “Another Rising Sun” dazzlingly launches the goings-on, then subsequently builds with him crooning ominously “A new plague is on its way and it’s waiting for your address!” Hirakawa also impresses with “A Nation Once Divine” and then again after intermission providing a simple A Capella version of “Behold The Child Warrior” underscoring young Koyo and his supporters’ struggles to procure an apology from Health Ministry officials. 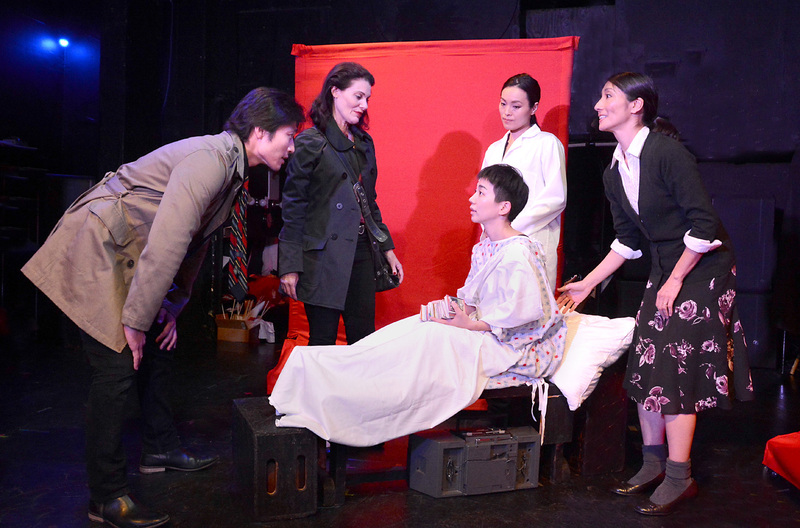 Theater at its finest, serves to enlighten, entertain, astound, and occasionally, even outrage–and Ackerman’s “Blood” offers all these things in full and radiant measure. It WILL move and transport you! Exotic, riveting, well-staged and unbelievable (but painfully true) “Blood” is ‘proof positive’ that amazing theatrical experiences can be found in smaller venues! Having ‘Previewed’ February 26th through March 4th 2016, “Blood” ‘officially’ opened on Saturday, March 5th, 2016 where it is slated to run through April 3rd, 2016. Show-times are Friday and Saturday evenings at 8:00 PM, with Sunday matinees at 3:00 PM. 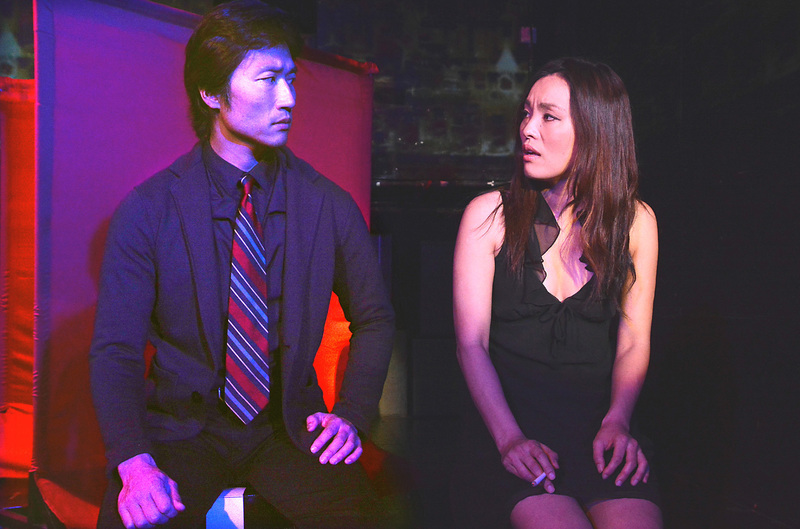 “The Complex” is located at 6476 Santa Monica Blvd in Hollywood California, and tickets for this engagement may be obtained by calling (323) 960-7745 or on-line by visiting: www.plays411.com/blood . Production Photos By Ed Krieger Courtesy of “Lucy Pollak Public Relations” And “The Garage”; Special Thanks To Lucy Pollak, Robert Allan Ackerman, Sohee Park, Benjamin Scuglia, And To The Cast & Crew Of “The Garage’s” World Premiere Production Of “Blood” At “The Complex” In Hollywood, CA. For Making This Story Possible. This entry was posted in Theater reviews and tagged "Blood", 2016 Southern California Theater Season, Chris Cester, Hollywood California, Hollywood Theaters, Japan AIDS Scandal, Japan's AIDS Infected Blood Scandal, Japanese themes Plays, Kabuki Theater, Kubuki Plays, LA 50 seat theaters, Mark Swanhart, Nick Ackerman, Plays about Japan, Plays with Music, Political Thriller Plays, Robert Allan Ackerman, Ryuhei Kawada, Tainted Blood, The Complex in Hollywood, The Garage Theater Company, World Premiere Plays. Bookmark the permalink.